Donald Trump on CBC delivering State of the Union. THAT’S TWO HOURS we’ll never get back. 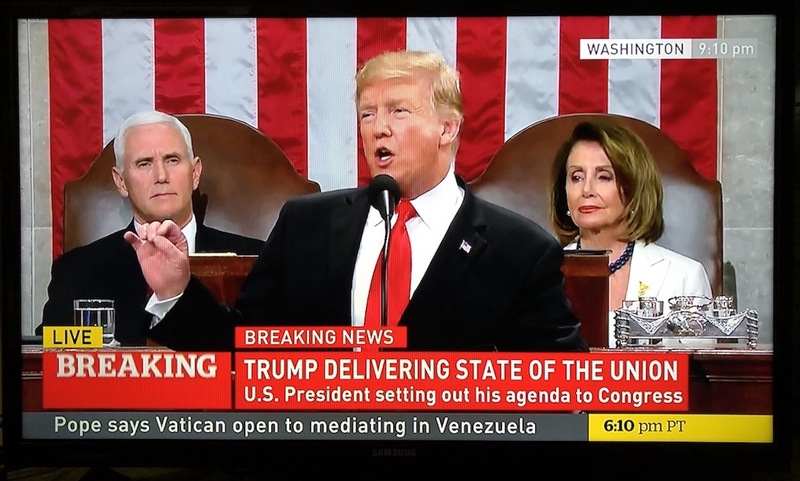 Did you watch the State of the Union address last night? If you were tuned in to CBC News Network, you had to. And, of course, there was The Wall. “I will get it built,” he declared. After each sentence, either the Republicans or the Democrats stood to applaud, depending on who agreed with him. And, thanks to CBC News Network, we Canadians watched, and afterwards we watched Stacey Abrams, a former candidate for governor in Georgia, respond on behalf of the Democrats. We need to stop funding the CBC. It continually shows that it has no idea of what being a Canadian is. There are only one or two Canadian tv shows on the CBC that are worth watching, the rest are bad enough to raise the retardation rate of Canadians. The CBC is just a waste of our tax dollars. Thank the Lord I only watched the summary of that address. I’m not sure which was the most predictable and boring, that unpresidential monologue or their emblematic football game a day or so ago. Both keep the stomach active. Well, we all know this guy by now. Why should CBC or any other network broadcast this clown show? Any even if they do, why would anybody want to waste 2 hours of their life watching it? These are questions I’ve been asking myself.